Committee for Excellence chair Fred Logan speaking at the session. The Shawnee Mission School District began its Legislative Information Series on Monday with an overview of its financial position. The news: things are grim. With a statewide deficit of nearly $50 million in K-12 education funding, the major message Monday was Shawnee Mission would be making more reductions and a change in the school finance formula is a must. Tim Rooney, manager of budget and finance, laid out the state of Shawnee Mission’s budget now through 2012-13. Rooney said without new legislation or a change in the school finance formula, Shawnee Mission could be facing a deficit of more than $30 million by the 2012-13 academic year. 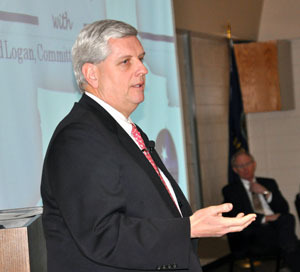 Fred Logan, chairman of the Committee for Excellence, spoke to audience members about how they can help influence lawmakers to do what is best for Shawnee Mission students. Contact legislators, Logan suggested. Be respectful and be patient. As reported in the Kansas City Star, the district is for the first time in a very long while considering altering its student-to-teacher ratio guidelines, possibly increasing the maximum class size in each grade by two students. “This is not something that we are happy to do or that we think is a good idea,” Johnson is quoted as saying about the class size increase in the Star story.